I finished up my tumbler quilt last week, and we have been using it daily. it's been COLD here in denver. Did that huge storm hit everyone??? what a blast of winter it brought. I quilted it a quarter inch from each seam. I'm finding that the less quilting a quilt has the softer it feels. 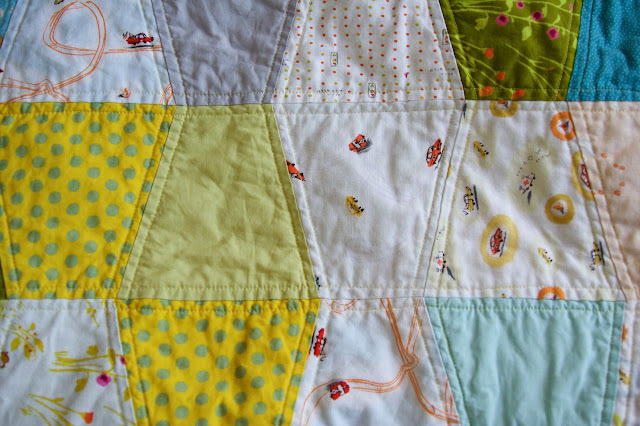 I thought I only liked super crinkly quilts, but I'm finding that I like less quilting too (especially on baby quilts). I rounded the corners, again. I have a feeling you'll be seeing a lot of those lately. I love not doing the miters on the corners. It seems to go so fast. I didn't get a full shot of the backing, but it's mostly the mustard print, with some scraps from the front. I used heather ross' Rabbits and Race cars line for this quilt, with some solids and basics mixed in. It took me a while to come around to this line, but now I love it. Such great boy prints. I used my accuquilt Go! cutter for this quilt, and a 6 1/2 inch tumbler die. I love less quilting also AND your rounded corners are awesome...I've been talking to my daughter about your fabulous quilts! I have a handfuls of fat quarters of that line that I am hoarding like a mad lady for the perfect boy quilt in a couple of years' time (when the toddler wants/needs an alternative to the one I just finished for him). Love what you've done with it! ok, you've made it official. i definitely have to make one. gorgeous. Your quilt is adorable. Love the colors. this is amazing. the round corners give it such personality!!! ;love the quilting you did too!!! i am a big fan of straight lines. This is a great boy quilt. I live in girl world, two girls aged 2 and 4, and have a hard time dreaming out boy designs/fabrics. I need to start up some boy or gender neutral for when we become a foster family. You've also got me thinking about doing rounded corners! I agree with the quilting. Either do it heavy for visuals or minimally for a good feel. Love those rounded corners! Did you have to use bias binding? Sweet! I'm discovering that I like less quilting too. Funny, huh? ...and I was just trying to decide how to quilt my tumbler blockish (it has annoyingly time-consuming sashing) doll quilt. YES! to the cold, down near Colorado Springs,and YES! to the less quilting. Makes them much more snuggly. 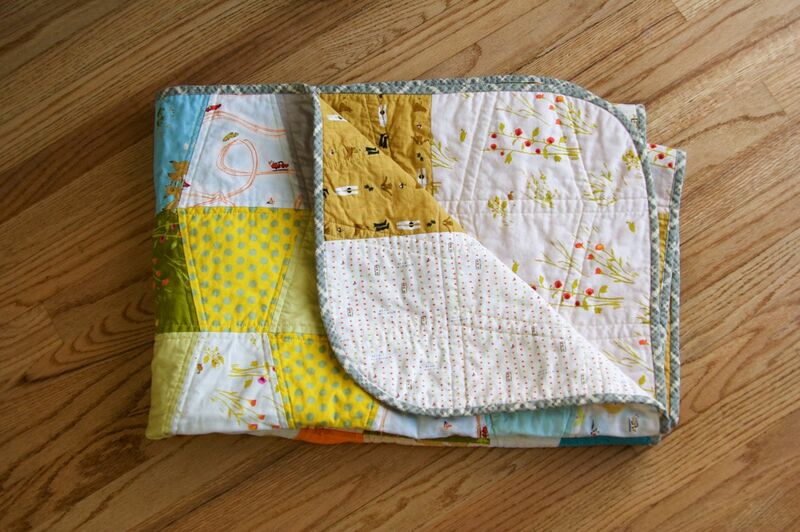 Love the quilt especially the rounded corners. I will have to try those on the next quilt I make. I love rounded corners...they make life so much more easier! I love the rounded corners on this. Beautifully done all around! could you tell me how you round those borders and make the fabric do the same? i think that would look so much better on the baby quilts i make. I like the "less quilting" idea. Will have to try it. I too never thought to look past the "crinkled" look. I also love the rounded corners. I had all my pots back outside, and pipes unwrapped, then, boom! another one hit today. I don't mind, as long as we're killing mosquito eggs (if you know what I mean :), or have you forgotten?? That is too cute for words - and a great pattern to showcase those prints. I have a bunch of that line stowed away. We find out what our new baby is next week so they may see the light of day soon if it's a boy! I've been inspired to try rounded corners too, and love them. Thank you for the inspiration! If only square corners could be fixed like photoshopping! This is gorgeous! Those rounded corners are calling out to me... do you have a trick? the rounded corners are fun! 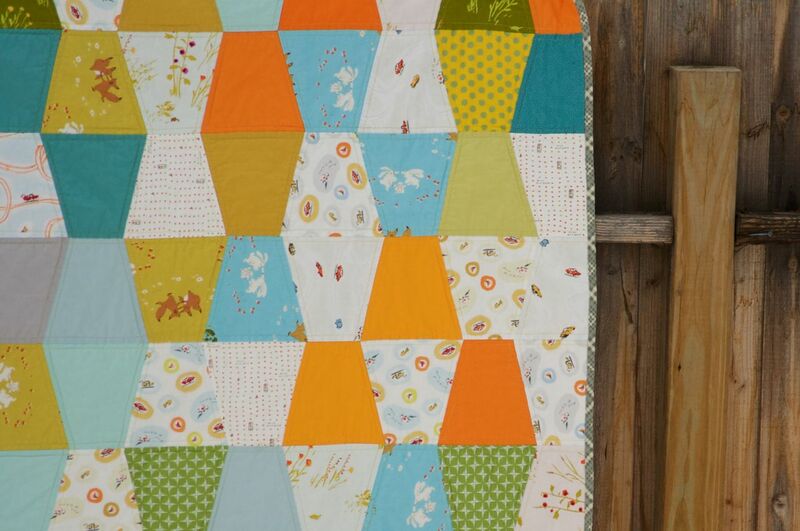 i love the simplicity of this quilt. also love the grey binding! A very really colorful quilt. What did you use to round the corners? 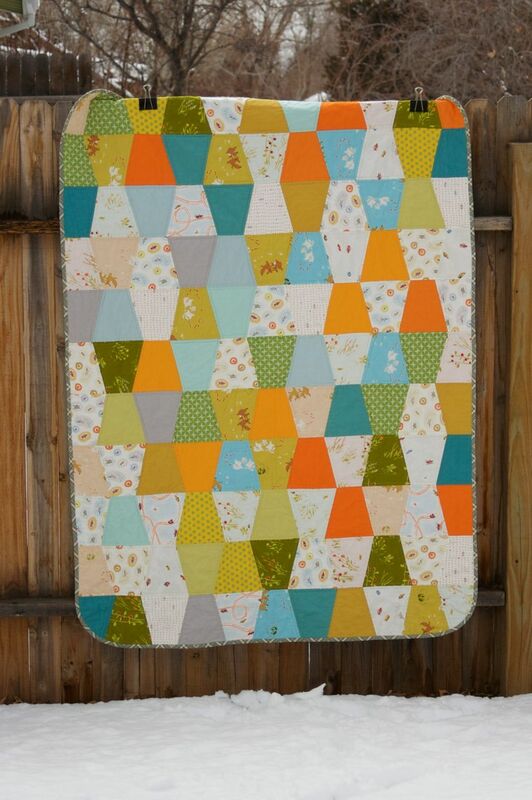 I love this quilt and the rounded corners are so sweet. I'm going to try them myself now! Your quilt is beautiful. Heather Ross makes such cute fabric. I like the rounded corners. Love the rounded corners!! I am going to try that sometime. My family is in Denver and so I have been hearing how cold it is. I hope you are all finding nice things to do inside. 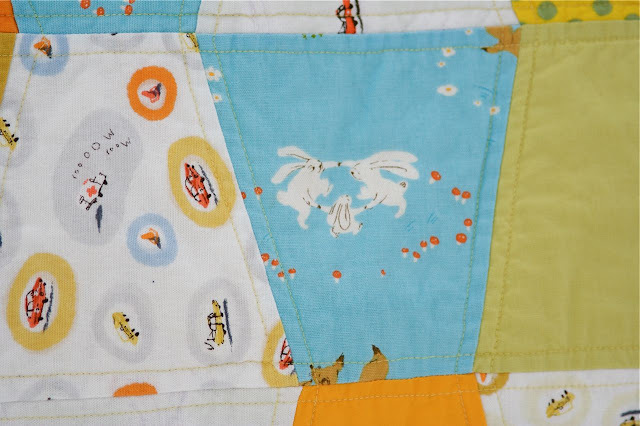 I just love that rabbit fabric! I wish I had gotten some of that when it came out. Your quilt turned out lovely. You are so great with color. Love everything about this. Great job! what a great color combo and pattern. The little dancing bunnies are adorable. A little love on Valentine's Day. Greetings from the Ebro Delta, Spain. aw, I really love this one! I have some tumbler blocks cut out, just haven't had time to work on them yet. I really have to try the rounded edges, adds so much character! I love love tumblers. The first time I made a tumbler quilt I thought I had "invented" the block since I hadn't seen it anywhere. HA! What a joke. I didn't realize you were in Denver! I live north of you and wonder where you get all your cool fabrics? I LOVE fancy tiger in Denver, but what else is there? One of your quilts just went onto my 'one day when I have money I want to buy one of those' wish lists. So beautiful!